Kiwi technology needs to sell itself smarter to realise it’s potential to become the country’s largest export industry, according to the latest Market Measures report. “We don’t face the same environmental constraints of the other two major export sectors, agriculture and tourism, so the potential for tech is virtually limitless,” says Owen Scott, Managing Director of Concentrate Limited, who organise the study along with fellow tech marketing company Swaytech. In its ninth year, Market Measures gathers information about sales and marketing from over 300 New Zealand companies, and compares the results to similar data from the USA. “We have talented tech sales people who convert leads at an incredibly high rate, but it’s the volume of sales that is the issue – this productivity challenge is one we have to solve to overtake the other two big export industries,” he said. “Our tech sales people are really ‘artists’, talented and creative and able to craft sales, but what we need more of is scientists – people operating within a rigorous system able to produce repeatable, predictable sales results at a lower cost,” said Mr Scott. “NZTE works with an increasing number of internationally successful tech companies but as the Market Measures study suggests, some of them – big and small – are forgetting to cover some of the basics that lead to export growth,” says Charles Haddrell, Customer Director at NZTE, the principal sponsors of Market Measures. It was big news in the Kiwi start up community last week when Apple confirmed it would acquire Auckland start up PowerbyProxi. And NZTech’s CEO Graeme Muller says that the deal is confirmation that New Zealand is on the right track to become a global tech story – and be known for our technology just like we are for tourism. “When the world’s largest tech firm purchases our technology, in this case PowerbyProxi, we know we are on the right track, doing some great things,” adds Muller. Muller says employment across New Zealand’s tech sector increased by 22% between 2015 and 2016 and now accounts for 6% of the national workforce. It’s been a few weeks now since Emirates Team New Zealand won the America’s Cup. A lot was said at the time about the technology and innovation the team developed and put together to win back the Auld Mug. From the cyclors and foil design, to the remote controlled wingsail, spectators and commentators were in awe of how “brave” the team were to not just think outside the square, but to come up with a totally different shape entirely. All of this with nowhere near the sort of money and funding that the other teams had. This sort of innovative thinking on a relative penny and dime budget is not something new to Kiwis, the Number 8 wire mentality is something of which we are rightfully proud. What most New Zealanders don’t realise though, is how successful our technology sector is, and sometimes it takes someone from the outside to come in and highlight it for us. Recently, Garage Technology Ventures’ managing director Bill Reichert spent four weeks in New Zealand as entrepreneur in residents at AUT. He travelled around the country, met with start-ups and produced an Innovation Report on what he found. You’ll forgive us for sounding like a broken record, but discussions about technology in education have been cycling for years now with the same message being conveyed; it needs to catch up. NZTech held it’s eighth annual meeting the other week where it announced the businesses that make up its community now collectively employ 100,000 people. Chief executive Graeme Muller says the growth of the industry is crucial not just for the sector, but for New Zealand’s economy and the nation’s wellbeing as a whole. But in a column in Idealog’s 2017 Technology issue, out next week, OMGTech! co-founder and Vend founder Vaughan Rowsell says more needs to be done to equip the future generations so they can flourish in the tech industry. Seeing as the World Economic Forum report predicts that 65 percent of jobs for primary school aged kids will have as adults don’t actually exist yet, he says it’s essential digital technologies and a strong knowledge of tech are taught to the youth of today. “Many young New Zealanders don’t believe they can have a career in these [creative and tech] sectors and that is just dumb,” Rowsell says. Kiwi students are looking forward to an education refresh that incorporates more technology use in classrooms. The ‘Digital Technologies’ literacy plan involves developing teachers’ skills to deliver new digitally focused curriculum to encourage problem solving skills required for the future. However, parents are concerned about their children will be spending even more time ‘looking at a screen’ and compromising traditional learning. To find out more about how learning in schools will change, click here. New Zealanders are using data at even higher rates than previous years. Both Orcon and Chorus have reported 50 and 60% increases in average data usage from 2016 to 2017. The average household uses around 160GB of data, mostly used up by streaming and gaming. This shows we are a country with a healthy appetite for new content and new ways to consume our old favourites such as movies and TV shows. To find out more about the latest statistics, click here. New Zealand MS patients are the subject of a new trial using what some are calling ‘space-age technology’. Farmers are in for a shock. According to Allflex Innovation and Business Development Manager, Pat Gunston, the technology revolution is on its way. “We didn’t think it was possible a few years ago, but now we put animals down a race and read their eartags as fast as they pass by,” explains Gunston. The New Zealand economy relies heavily on farming but many agree that we shouldn’t be. As technology advances, the future of farming is put at risk. To stay relevant and important to the country, the farming communities need to find ways to optimise and streamline their processes through the use of technology. We’ve assumed it for a while but Mastercard, in a recent survey of 1000 New Zealanders have found that 90% of people choose digital payment options over cash. So what will happen to the money when digital payment completely takes over. With the rise of apps like Apple Pay, its making it even easier for anyone to digitally pay for goods and services, especially in traditionally cash driven areas such as communities. To find out more about the outcomes of the survey, click here. Tags: What's the use of money? Our Communications Minister, Simon Bridges, recently released the Building a Digital Nation report which outlines several programmes to drive New Zealand towards becoming a digital nation. One of the programmes discussed is an alliance between the digital sector and government to explore the economic and social benefits of the Internet of Things (IoT). The alliance will provide a forum for enabling us to better understand the benefits and potential issues of IoT, such as privacy and cyber security. “Initial research by the alliance, which will provide an evidence base for future work, already suggests potential economic benefits to be in the hundreds of millions of dollars for the New Zealand economy through the deployment of IoT across a variety of sectors,” says Bridges. To find out more about the alliance and the full Building a Digital Nation report, click here. Code Club Aotearoa has partnered with the Raspberry Pi Foundation. The Foundation works to put the power of digital making into the hands of people all over the world. They provide low-cost, high-performance computers that people use to learn, solve problems and have fun. To find out more about the Raspberry Pi partnership and Bijesse’s learnings from the Meetup, click here. The career options for students who want to combat cybercrime are expanding so rapidly into fields like law, research, teaching and insurance that a leading Hamilton based cyber security research centre is urging secondary school students to get serious about tapping into this exciting job market. Globally, unfilled cyber security jobs are predicted to reach 1.5 million by 2019 and international experts say the entire cyber security sector unemployment rate is zero percent. The government’s cyber security strategy annual action plan report released last week shows the government-appointed cyber security taskforce aims to introduce a secondary school programme to help position students for higher level study towards cyber security qualifications. Cyber Security Researchers of Waikato (CROW) associate professor Ryan Ko is a member of the New Zealand cyber security taskforce and says secondary school students need to be informed of the massive cyber security career potential for their personal benefit and that of the New Zealand economy. “We need to train more Kiwis in cyber security to align with the fast growth and deployment of new technologies. This is important to protect New Zealand because tech is our fastest growing industry and a lapse in cyber capability would be detrimental to the economy. “Only 23 percent of board of directors actively participate in security policy and $34 billion could be added to the New Zealand economy if businesses made more effective use of the internet. “A range of job roles are appearing within popular career sectors like government, law, research, teaching and insurance where there is a demand for employees who have skills and knowledge in cyber security. “Top executive positions are also being established that have chief risk officers reporting directly to the chief executive and if this trend continues, it opens up exciting career pathway opportunities for junior cyber security professionals,” Ko says. CROW runs the annual New Zealand Cyber Security Challenge for secondary school students who want to learn more about cyber security, show off their skills and chat to industry experts about what it takes to develop a career in cyber security. In only its fourth year, the shape of the challenge for 2017 has changed to keep up with the rapid changes in security-related jobs that are occurring as the world adapts to advancing technologies. “Rapid growth of the Internet of Things (IoT) means devices are being deployed into consumer environments – homes and offices – with very poor or non-existent security features. These devices can easily be compromised and used in malicious activities. “This year we have introduced a new policy-based round to the challenge because it is important that students have a broader viewpoint of security. Students will need to assess the risks associated with emerging technologies like drones and look at how to apply and enforce policies which will help to protect organisational assets,” Ko says. The challenge, which includes a career fair, is attractive for small to medium businesses as it is a chance for them to compete against and scope out talented future employees from within New Zealand’s secondary school and tertiary sectors. Around 500 participants from all over New Zealand are expected to compete from mid-June with the top 150 gathering at the University of Waikato campus in July to receive hands-on training and compete in teams to become the 2017 New Zealand Cyber Security Challenge Champions. For more information contact Make Lemonade news editor Janelle Blythe on 021 662 138. Disruption is hitting the global electricity industry and New Zealand tech companies have the potential to lead the world with innovative solutions. Callaghan Innovation and Creative HQ are calling every coder, inventor, tinkerer, engineer, or ideas person to enter an Innovation Challenge from February 1 with ideas pushing boundaries in how consumers and businesses use, manage, distribute, transmit, and generate power. Selected finalists will present to an expert industry panel for the chance to win prizes and access to industry partners. eStar is Australasia’s leading specialist eCommerce solutions provider, delivering outstanding experiences with some of the region’s best brands, through a combination of thought leadership, user experience, development, design and partners. Clients include Country Road, Briscoe Group, Swanndri and Smiths City Group, amongst many others. For further information contact Make Lemonade news editor Janelle Blythe on 021 662 138. Soul Machines, based out of Auckland, are leading the world in humanising Artificial Intelligence innovation. The company has just unveiled their first virtual assistant, an emotionally intelligent virtual agent. With financial backing out of Hong Kong, this technology promises to deliver big things across a range of different industries while putting New Zealand technology on the map. Drones, robotic technologies, and automated on-farm sensors – they’re all on display near Hamilton, as LIC’s Innovation Farm plays host to the agricultural showcase ‘Farming2020’. Farming 2020 is among the signature events included as part of an inaugural three-day event, Techweek17, which takes place from Tuesday 9 May. Wayne McNee, Livestock Improvement Corporation (LIC) chief executive, said the company was delighted to host Farming2020 at its unique Innovation Farm in Rukuhia. The LIC Innovation Farm included sensor technology that provided instant information on milk content being produced by its cows (commercially farmed on-site). The farm also included automated in-shed technology, including leading-edge Protrack™ herd management systems and in-line milk meters. Farming2020 would showcase some of New Zealand’s leading AgTech businesses and solutions in what was increasingly a digitally-connected farm environment, Mr McNee said. Farming2020 organiser, Wharf42, said the event would educate a diverse audience about how digital innovation was impacting on agriculture’s long-term future. Peter Wren-Hilton, principal architect of Farming2020, said the audience included industry representatives, other tech innovators, investors, media, and groups of students from schools across central North Island. Agricultural robotic, drone, and on-farm sensor demonstrations would be a highlight, along with other smart AgTech platforms. Beside educating its audience and sharing ideas, the event would also capture high-grade content for future use in participating New Zealand AgTech companies. A special event at Parliament next week will mark the 15th anniversary of the New Zealand Health IT (NZHIT) cluster as digital technology gains momentum in the health sector. The NZHIT group was formed in February 2002 in a major push to start digitising all things health. To mark the 15th anniversary, NZHIT chief executive Scott Arrol says they will be holding several events throughout the year to emphasise the significant part the organisation has played in the health sector in the last 15 years and to highlight the substantial contribution NZHIT will make well into the future. “It is fitting that the first anniversary event is being held at Parliament on February 14 and I will outline the future of the health IT sector over the coming years. The Ministry of Health will also be presenting an update on their single electronic health record (EHR) project, which is a topic of considerable interest to the whole health sector in NZ. “The EHR will enable patients, clinicians, DHBs and the wider health community to use health data to support better health outcomes. The first stages of the project are well underway. “Also, our 15th anniversary coincides with 2017 being an election year so it is fitting that we’re holding the first event at Parliament. This will provide the opportunity for people keen to be involved in health IT to mix and mingle with politicians from across the political spectrum while demonstrating the strength and relevance that we bring to enabling a healthier New Zealand. “Our NZHIT digi-health membership is growing rapidly as service providers, companies and organisations embrace health IT. We have a firm vision for interoperability and we have done a lot of work in this area since the first Cloud in Health symposium for New Zealand. Arrol says the healthcare sector has the fastest growth in IT spending in New Zealand, bringing exciting opportunities for health IT companies, especially now that the technology industry is New Zealand’s third largest exporter. For further information contact NZHIT chief executive Scott Arrol on 021 414631 or Make Lemonade editor-in-chief Kip Brook on 0275 030188. Digital transformation is taking hold of the world – and with it an appetite for security and privacy risk, a digital expert says. Hayley Carthy, chair of the DX conference in Auckland next month, says New Zealand is tracking strongly as it transforms to the digital world. “New Zealand has some great success stories in finance, health and biotech that have gained recognition on the global stage but digital transformation means different things to different organisations. There is no one size fits all or we’d have all nailed it by now. That said, we as a nation, are in great shape. “Being relatively small means we are nimble and not typically impeded by scale, but we need to learn how to better use this to our advantage. This takes appetite for risk and people who understand how to execute without compromising trust and integrity – remembering security and privacy amplify in the digital world. “I don’t necessarily think we should be striving to be digital pioneers in every industry – rather pursuing the right opportunities that will have a great impact. “In today’s fast paced world one universal driver for digital is efficiency – time and money. Beyond that it’s important to clearly understand the outcomes you’re seeking by going digital: How can digital enhance or accelerate delivery of our business strategy? And can digital help remove barriers for success? “Accessing the capability we need in some areas can be a challenge as we are competing with larger populations when it comes to luring scarce resource. Injecting fresh thinking is vital and helps extend and challenge the thinking of others. “The March 22 DX conference in Auckland will be a great opportunity to hear how other organisations are tackling their digital journey. While digital transformation means different things to different organisations, there’s a lot we can learn from each other. I’ll certainly be taking on board every insight I can from our great line up of speakers. “One major government department project is Inland Revenue’s business transformation which is easily one of the largest in scale and ambition in the Government sector – making it simpler and faster for New Zealanders to pay and receive their taxes and entitlements. Another government agency making an impact that most of us will have seen in action is NZ Customs Service with their border modernisation programme. “In industry, the digital transformation led by Xero is a great example. Keep in mind digital is not just about removing paper. If you think of it that way you’re only seeing a small part of the opportunity. “So the future of digital has to be beyond simply translating existing processes and services to digital. To transform we need to re-imagine every interaction, transaction, service into an opportunity to meet a customer need that they didn’t even know they had! That’s the sweet spot where digital success lives and thrives. “Digital brings the rest of the world to our doorstep, and vice versa. Barriers that used to exist are broken down, meaning boundless opportunities for NZ to contribute and compete on a global scale,” Carthy says. For further information or to arrange an interview with DX conference chair Hayley Carthy contact Make Lemonade editor-in-chief Kip Brook on 0275030188. Technology is at the heart of improving productivity of government services and the second annual NZTech Advance Government and Technology Summit in Wellington on February 28 will play a landmark role in helping New Zealand become a stronger digital nation, NZTech chief executive Graeme Muller says. The summit is a high-level event that will host the key players from government, industry and technology to lead discussions on transformative technology aiding the delivery of better public services. The event will offer insights from people working behind the scenes about the government’s ICT strategy framework and the complex issues behind the government adoption of the public cloud. The public sector is single largest customer of the tech sector. “This year we focus on advancing the use of technology across the public sector and building stronger collaboration across government,” Muller says. “Among those attending are leaders and executives from government and technology, senior policy makers, senior advisers, controllers and strategists from government agencies and enterprise architects, technology and operations managers from local and central government, health and education. “The summit has also attracted risk officers, transformation leaders, performance leaders and business partners within government and industry and finally chief information officers and their top team members from NZ-based and international companies. “New Zealanders need to understand the benefits and challenges of implementing the acceleration of public cloud services. We must realise the deeper implications of working with data and security in the cloud. “We will discuss how government and industry leaders can build a culture within government to support tech transformation and become a strong digital nation. “Transforming government services will lead to better outcomes for all New Zealanders, especially those in most need. With up to 40 percent of all money spent on tech in New Zealand spent by the public sector, enabling agencies to share innovative ways of using technology will drive better public services. “Technology is at the heart of the transformation that government is looking for. NZTech is committed to working with government to enable this transformation. “Productivity lies at the core of New Zealand’s long-term economic challenges. Hard won in a small isolated economy, productivity in New Zealand has declined over the past 40 years, compared to other small developed economies. With services making up 70 percent of New Zealand’s GDP, it is here that the greatest productivity challenge exists. “Technology is at the heart of improving productivity of government services. Discussions between government and industry are now far more “gritty” and open, and able to grapple with real issues faced by agencies. Muller says next month’s summit at Te Papa is central to both the government’s aspiration for the economy and transforming the way government operates and delivers public services. The tech the industry believes that more can be done to work alongside government to help bring about positive outcomes, he says. The future of transportation has landed at Christchurch International Airport – a future in which drivers and steering wheels are redundant. The airport this morning launched the fully autonomous (driverless) electric shuttle bus it will be trialling on private roads around the airport campus over the coming months. The shuttle can carry up to 15 people and has been bought by HMI Technologies, which is working with the airport to conduct New Zealand’s first trial of a fully autonomous vehicle. The trial is being supported by Christchurch City Council, the University of Canterbury and the Transport Agency. The shuttle will be trialled initially on private roads around the airport but once its safety has been proven the trial will shift to public roads. Mayor Lianne Dalziel is excited by the possibilities fully autonomous vehicles could bring and pleased that Christchurch – the home of innovation and creativity – is leading the way. “Autonomous electric vehicles are part of our future. They are coming ready or not and I’d rather be ready. Christchurch has become a city of opportunity … a place where anything is possible. The significance of attracting this project to Christchurch at this time cannot be over-stated. This is an incredibly exciting time in our history,” said Ms Dalziel, who was one of the first passengers in the French manufactured shuttle. Christchurch International Airport chief executive Malcolm Johns, Christchurch Mayor Lianne Dalziel, Transport Minister Simon Bridges and HMI Technologies chairman Mohammed Hikmet celebrate the launch of the driverless shuttle trial. Speaking at the launch, Transport Minister Simon Bridges praised the Council for supporting the trial. Mr Bridges said while the Government was not directly involved with the trial, it would be watching it closely, with great interest. “I believe firmly the vehicle of the future … is an autonomous or driverless electric vehicle that increasingly we won’t own,” he said. They would be safer, more efficient, and bring significant environmental benefits. “This is an exciting and historic day, not just for Christchurch, but for New Zealand,” the Minister said. Christchurch Airport Chief Executive Malcolm Johns said the airport team was keen to understand how autonomous shuttles might operate at Christchurch Airport and how people might react and interact with them. This portable handheld device known as an infrascanner can tell in minutes whether a patient has a brain bleed. Using the same technology as your television remote, a new portable device is about to land in New Zealand that can detect brain bleeds instantly. The device, called an “infrascanner”, has been approved for use on our shores. It can pick up life-threatening brain haemorrhages and clots in head trauma victims injured on rugby fields, in nursing homes and in car accidents. It scans a person’s skull, firing infrared signals into the skull to a depth of three centimetres, then shows a negative or positive result. 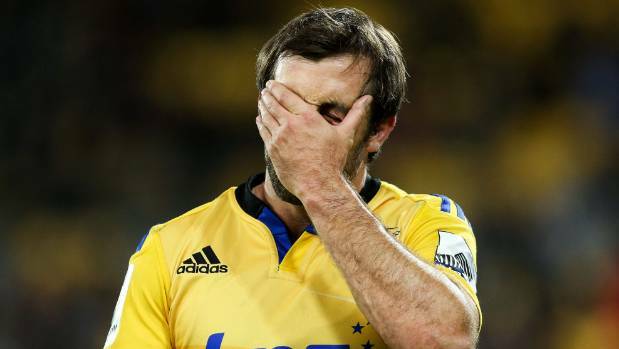 Conrad Smith of the Hurricanes holds his head after returning from a concussion test during a 2015 game against the Chiefs. The infrascanner could be useful for rugby teams in detecting injury, say its distributors. “If it shows a red dot, you know there’s a bleed,” Peter Bailey, the sole distributor for infrascanner in Australia and New Zealand, said. Bailey said the technology was developed in Israel, and was already used in the United States, India and parts of Europe and the Middle East in warzones, on sports fields and among frontline medical staff. No-one in New Zealand has yet got their hands on an infrascanner, but the hope is for it to be rolled out among major sporting bodies, public and private ambulance services, trauma centres and remote healthcare facilities. At about A$17,000 a unit (about NZ$17,900), the technology isn’t cheap, but had about a 94 per cent rate of accuracy, Bailey said. And if there’s no bleed, there’s the potential to save time and costs of further treatment and tests, Bailey, also a Melbourne paramedic said. Wellington Free Ambulance head of clinical services Paul Fake had not heard of the device, but said his team was always interested in new technology that could improve patient care. “We’re finding more and more that devices that were originally only available at emergency departments are becoming available to our people who are assessing and caring for people in all sorts of locations. The device has been used on Olympic athletes, in prisons, helicopter rescues and remote areas such as mines, oil rigs and rural areas with limited health resources. The infrascanner is manufactured by InfraScan Handheld Brain Diagnostics nad has been in the making since about 2004, but this model had been around for less than two years, Bailey said.